I’d been talking about trying to get down to Wimbledon this season to see some tennis. Silly really that I don’t go down every day as it’s so near to me – but it’s been 8 years since I last went along, queuing late afternoon and getting into see some fabulous games late into the summer evening. However I was spurred into action by my friend Ismena Clout who posted on her blog a ‘list for living‘ and number 34 on the list was attending Wimbledon. I have recently started playing tennis again at a local club (although not for a while since my fall in Australia and my somewhat ‘oddly shaped’ knee and as part of joining up for the coaching I was encouraged to become a member of the LTA British Tennis. What a bonus because they sent me an email to say that although I wasn’t eligible (as such a newbie) to enter the first Wimbledon ballot, I would be eligible for the second ballot. 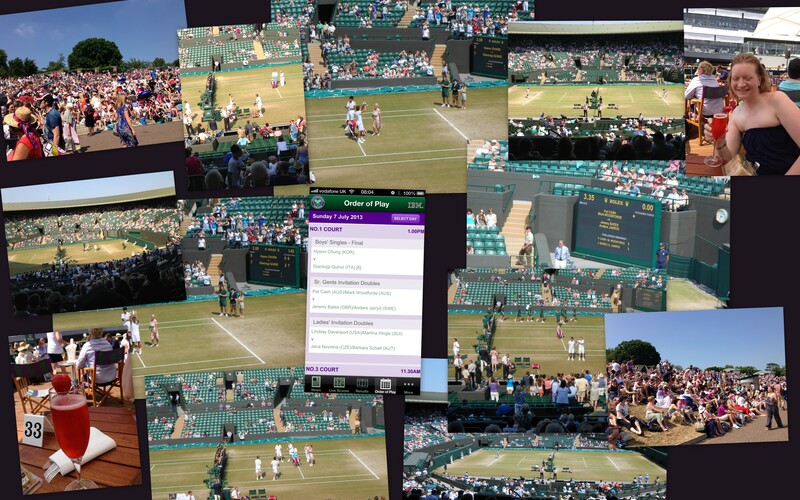 At 10am on 7th June I was therefore ready to go… How surprised was I to see that there were actually tickets available AND for the final day of Wimbledon! Little did we know but Andy Murray would also be appearing on the last day having got through to the men’s final. What a fabulous day. We started off with a little light refreshment (errr bubbles) and strawberries & cream. Most of our day was spent in Court No 1 (where we had tickets) and watched the final of the boys juniors (both boys will be adults next year so looking forward to seeing them get through to the Men’s Final next year); Invitation Senior Gents Doubles (with Pat Cash who I last saw at Wimbledon in 1985! ); Invitation Ladies Doubles and then Invitation Gents Doubles. BUT we did leave Court No 1 and headed out to see if we could get a spot on Murrays Mound during the epic Men’s Final… boy was that placed absolutely packed. So we headed off to Court 2 where they were showing it on big screens. The atmosphere was A-mazing… even more so when we saw Andy Murray WIN! The first British man to win for 77 years. Thank heavens – the nation were behind him… as long as he won! This entry was posted in Living and tagged Bucket List, Royal Marsden by AnnaGoAnna. Bookmark the permalink.